E-commerce in Kenya has experienced rapid growth in recent years. This provides a unique growth opportunity for local businesses and in turn to create employment & support the government’s Big Four Agenda. We expect e-commerce sales to grow 10x in value terms over the next 4-5 years (vs 2017). This may sound aggressive, but it’s based on a conservative benchmark of how the industry has evolved in other parts of the world. Today, only 0.5% of retail takes place online in Kenya. Compare this to 23% in China, 17% in the UK, 8% in the USA, and 5% in India. If we allow e-commerce to flourish & it evolves in the same was as it has done in India, we can expect online retail to account for 5% of total retail sales by 2022. This represents a huge opportunity for job creation. Online marketplaces provide the digital infrastructure to help businesses grow – both those trading on the platform, and those providing supporting services. With growth, comes jobs. We estimate that e-commerce provides employment for up to 20,000 people in Kenya today. These people are either employed with e-commerce companies directly (like Jumia’s 300+ staff) or more likely, indirectly. KPMG estimates that in India, every direct e-commerce job creates 3-4 downstream jobs in supporting industries (eg. logistics providers, 3PLs). Today, Jumia has 7000 vendors selling on its platform. These range from large businesses like Nairobi Sports House (who might employ 3-4 people to manage their Jumia sales) to SMEs (who typically employ 1). These people are managing their online stores and dropping off products with Jumia. To support the sales of these vendors, Jumia works with over 10 3PLs, who employ over 300 staff to help deliver our orders. To support the creation of products for vendors, Jumia has a platform for 30+ photographers & content writers. With 10x growth by 2022, we can expect the e-commerce industry to support at least 200,000 jobs. The industry will allow entrepreneurs, including women & people in rural areas, to build meaningful businesses & will support a thriving local manufacturing sector. To put this in context, China has 10M people working in e-commerce today. 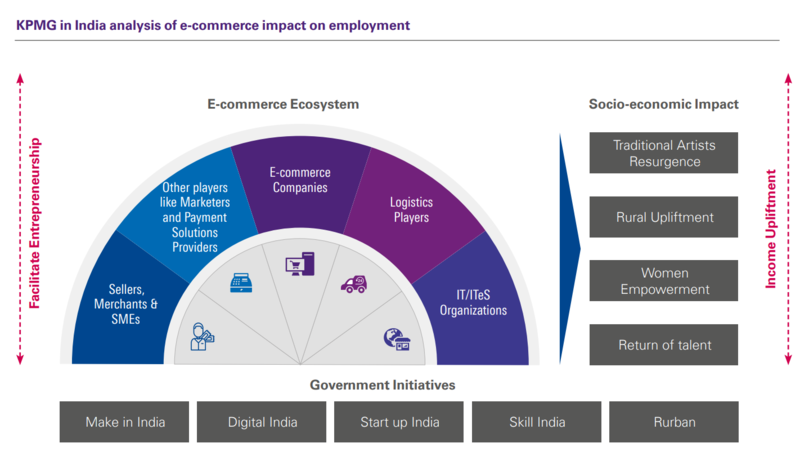 India is expected to have 1.5M jobs in e-commerce by 2021 (of which ⅓ are “highly skilled” roles), with an additional 10M new jobs created by vendors. First, we need to get better as an industry. We need to offer more choice to customers, at better prices, more consistently. We need to on-board & train more vendors. And we need to do a better job to protect customer experience whilst these vendors learn the ropes. Second, the cost of data needs to come down, to make digital services more accessible for millions of Kenyans. Today, the internet infrastructure is good, and there are a lot of smartphones, but people can not afford to “live digitally”. Thirdly, we need to build confidence in e-commerce. In particular on the customer side (the vendors will follow). Here the government can play a supporting role in raising awareness of e-commerce & educating people.